Do you need a Hardening or a Non Hardening medium? If Hardening then you have a choice of Single pack or Twin pack solutions. If your system is Glycerol tolerant than choose a Glycerol Based product, if not then use a Glycerol Free solution. These high refractive index mountant solutions are to be used where you wish to obviate the effects of spherical aberration (caused by a mismatch between the refractive index of the glass of the coverslip and the mountant medium) which leads to a loss of resolution of your images. The table below illustrates the main types of Antifadent solutions available from Citifluor. The product names in the table link directly to the product information (another page) in the Antifadent Solutions Products section. A more detailed account of our anti-fadent Solution products can be found in the Products section. The following is a brief overview which we hope helps you to decide on the best solution for your application. If you are still unsure about which mountant media solution to use, please don’t hesitate to contact us, either by phone or email. We have experienced technical staff on hand who are happy to answer the simplest, or the most challenging of questions. A summary of the Pack sizes and Storage conditions for all Citifluor Antifadent products may be downloaded as a PDF. AF1 A glycerol-PBS solution contains an amine antifadent. AF1 plus DAPI contains both an amine antifadent and the DNA stain, DAPI. AF2 A glycerol solution contains an amine antifadent that allows you to choose your own buffer solution. AF4 A glycerol solution of n-propyl gallate. These High Refractive Index Mountant solutions have been developed to minimise the effects of refractive changes which occurs when light passes through the objective lens of the microscope and through the coverslip. Our new solutions have shown that matching the refractive index of the mountant to the coverslip and objective lens has led visualisation of species in bodies up to 160µm thick (See figures kindly supplied by Dr Sean Speese and Colleagues of the Jungers Centre for Neuroscience, Oregon, USA). CFM-1 is a glycerol-PBS buffered solution having a refractive index of ~1.52 which can be used for transmission microscopy as well as with epifluorescence microscopy. 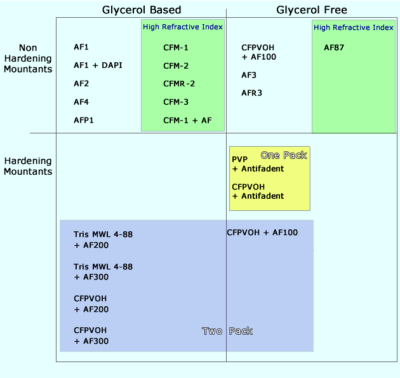 CFM-3 – This glycerol-based antifadent contains a phoenlic antifadent of neutral pH and a refractive index of ~1.52 which also acts as a Clearing Solution enabling visualisation of fluorochromes deep within the sample. CFMR2 – This product was designed for use with samples labelled with GFP. It contains a unique antifadent which does not de-oxygenate the solution which is an essential property if the GFP is not to bleach. Hardening mountants are aqueous solutions containing a polymer such a poly (vinyl alcohol) (PVOH). When a few microlitres of these solutions are pipetted onto a microscope slide and a coverslip applied; evaporation of water slowly takes place and the formation of a stable film results which immobilises the coverslip. A variety of hardening mountants is available which provide films possessing a range of hardness. Our range of materials consists of two types: Single Pack and Two Pack. Both types are based on water-soluble polymers such as poly(vinyl alcohol(PVOH) and poly(vinyl pyrrolidone)(PVP). The Single Pack materials are composed of the polymer solution plus the antifadent whereas the Two Pack are sold as a supply of the polymer solution and a separate supply of an antifadent solution such as AF100, AF200 or AF300. The Single Pack materials are all glycerol-free. 4-88, glycerol, water and tris-amine buffer. Following evaporation of the water a film of weak to medium strength is formed. To have effective reduction in photobleaching, it should be used with either AF100, AF200 or AF300. CFPVOH is an aqueous solution of poly(vinyl alcohol) and is designed to be used with the glycerol-based antifadent solutions AF200 or AF300. Following evaporation of the water films of medium hardness are produced. All the following materials are designed as Two Pack systems. AF200 is a glycerol solution containing an amine-based antifadent. AF300 is a glycerol solution containing a phenolic type of antifadent. PVP plus antifadent is an aqueous solution of poly(vinyl pyrrolidone) containing an amine-based antifadent. The solutions are stable over long periods e.g. in excess of five years. CFPVOH plus antifadent is an aqueous solution of a carefully selected PVOH containing an amine-based antifadent and has a shelf life 6 months.